Flowers, candles, vases…oh my! My ideal centerpiece! Hello everybody! I hope you guys are well. Today let’s talk about centerpieces and how daunting they can be. Nowadays, I believe people want to stay on a budget and they want their centerpieces to sort of be unique. Those two criteria were very important to me when I was planning my anniversary/vow renewal party. The only difference this time around was the fact that my husband and I were paying for EVERYTHING, including the banquet hall, which my parents paid for eleven years ago. I still gave myself a budget back then because I didn’t want my parents to spend a lot of money so I chose a venue that practically had everything in the place. That saved a lot of headaches, time, and money. My venue, The Astoria World Manor, has a chapel, photo studio, and banquet hall. You can’t get any better than that. But I digress, back to the centerpieces. There are definitely your traditionalists who chose the vases with the flowers or floating candles and that’s ok, but I wanted something different. I also wanted to arrange it myself. Remember, we’re on a budget here people. 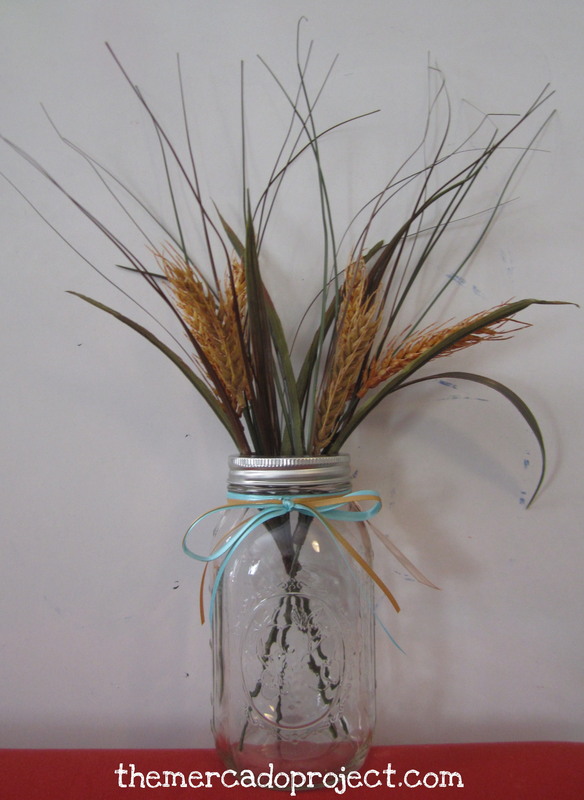 🙂 I searched for ideas and pictures on Pinterest, of course, as well as images on AOL search and immediately fell in love with arrangements that featured mason jars. Vases are good and there are different shapes, sizes, and prices, but mason jars can be used for storing all kinds of stuff including food! They’re simply functional and I wanted them. Badly. So when I spotted them at the craft store for $1.49, which is a great price because for some reason I thought they would be more expensive, I couldn’t stock my shopping cart fast enough. Needless to say, I was very happy. 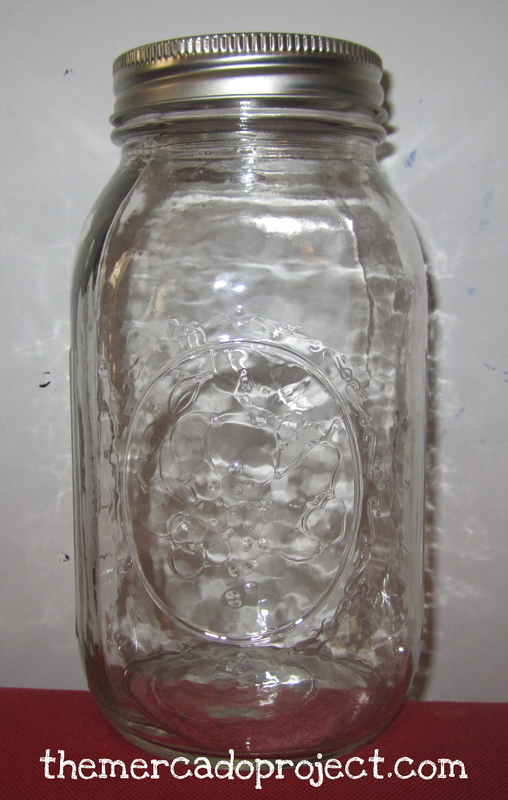 I know it’s just a jar, but the point is, I found them. That’s half the battle. Onto the next step, what’s going inside? I knew I didn’t want real flowers. I also knew that artificial flowers could add up to be expensive. So I went around searching for a bushel of flowers, artificial, that I could separate and possibly distribute evenly. I found one at the craft store that had mini wheat stalks and long leaves. The price was right and I liked the way they looked, so I bought four of them. 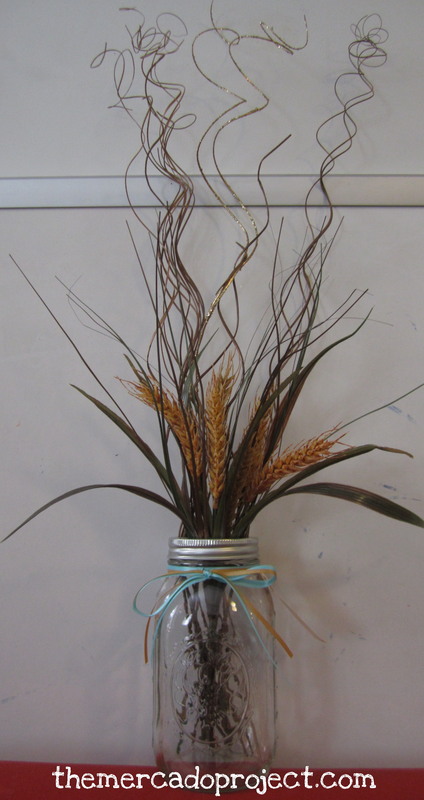 I also chose to fill the jar with gold glitter and natural curly ting stems. They come in bunches (around 30 per bunch) and are reasonably priced so they were ideal in order to distribute among the jars. Putting them together, I had the height and fullness I wanted, but I still needed a flower. I wanted to incorporate the turquoise color so I searched online for a turquoise gerbera daisy. Eleven years ago, the gerbera daisy was the main flower in my wedding bouquet, only it was white so I thought why not? I have to admit though that I did procrastinate on finding the flower until I found a good-looking and reasonably priced one on a website. I put a dozen into the cart, clicked CHECKOUT, and almost fell off my chair when I saw the shipping and handling charges. They wanted almost twenty dollars!! for shipping twelve artificial flowers. I deleted that cart so fast and I was so furious because I still had no flower or idea of what to do. Something you must know about me…I do not have the greatest memory so I can’t tell you how I came about thinking about paper flowers. 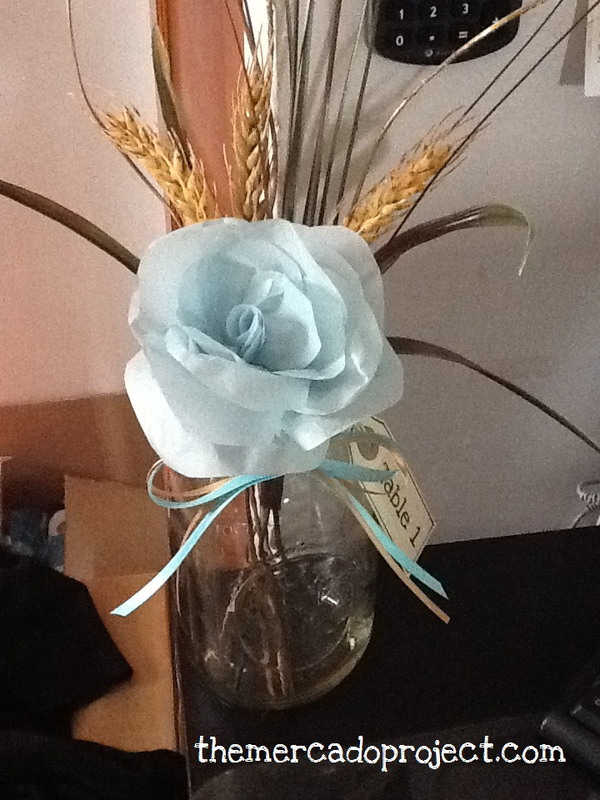 I just know that one day I searched DIY PAPER FLOWERS and was bombarded with tutorials online. I saw videos on YouTube and read several blog instructions, but ultimately I ended up using a freehand template, courtesy of my husband’s artistic talent, tissue paper, glue, lollipop sticks and gold acrylic paint. My masterpiece, made out of tissue paper! 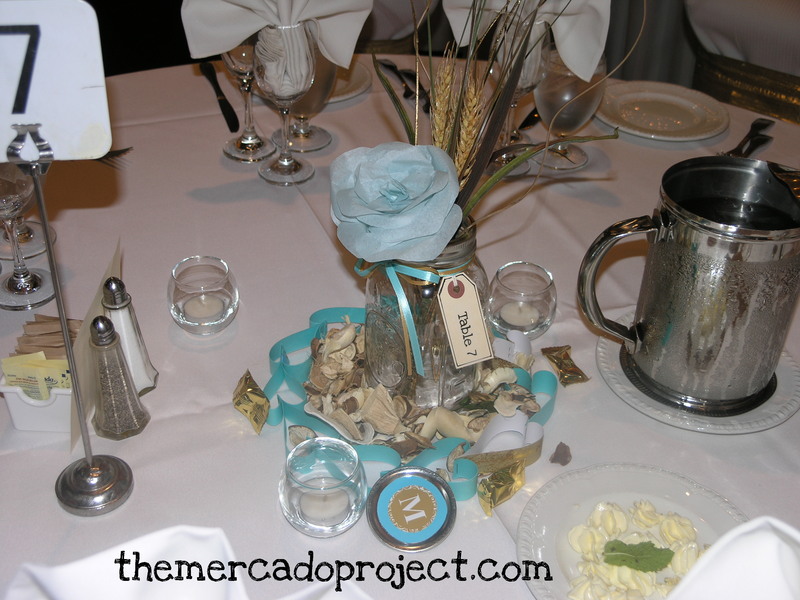 I also tied a gift tag with the table number and ribbon in my color palette, turquoise and gold, around the jar to complete my look. Here’s my centerpiece on table #7. I made a heart paper garland (a later post), as seen on Pinterest.com, using my colors. I threw potpourri, which I got from IKEA, inside the garland to surround the mason jar. I also covered the lid by simply cutting out and gluing a circle from turquoise card stock and affixing a monogrammed sticker.